Proper rest and sleep when sufficiently tired is absolutely necessary for good hair. Keeping away from stress is must. Do Exercise, Yoga, Meditation. Daily Routine – Comb your hair. Put Oil for 1/2 – 2 hours or overnight except for rainy season. Wash your hair with shampoo. Use conditioner if required. Dry your hair naturally. Consume a healthy and balanced diet rich in minerals and vitamins. Eat healthy and give your hair the right amount of vitamins. Since hair is made of proteins, make sure that you eat a balanced diet rich in lean protein, whole grains, fruits and vegetables. A healthy diet will ensure better-looking, better-feeling hair. Make sure you get plenty of vitamin C (strengthens hair), vitamin B5, vitamin E, iron (helps transport oxygen to blood vessels), zinc (grows and repairs tissue), and omega-3 fatty acids (grows healthy hair). Hair should retain some natural oil after washing. Scalp should be clean and well nourished. Hair must be totally dry before it is combed. Pure Coconut oil is best for hair. Parachute coconut oil is good. You can also mix it with Parchute Coconut Jasmine hair oil. Mixture of oils is also good. In India, Coconut Oil – Parachute, Jasmine Oil – Parachute, Almond Oil – Dabur or Bajaj, Amla Oil – N/A, Olive Oil – Seven Seas Olive Oil. Retains the moisture of hair, thus making your hair soft and manageable. Coconut oil penetrates well within the hair shaft and prevents hair from losing moisture by acting as a sealant. As a result, hair is less likely to suffer damage and stays dense as well as strong. The lauric acid that coconut oil is rich in has significant action against viruses, bacteria and fungi and this ensures you keep away from infections of the scalp, too. Sweet almond oil is highly effective because of its emollient or softening action. Rich in vitamins D and E and minerals such as calcium and magnesium, almond oil acts as a natural moisturizer for your hair, preventing it from turning dry and brittle. As a result, there is lesser hair loss. Helps to tackle hair problems like excessive dandruff by completely eliminating dandruff and keep it from coming back. Helps to reduce hair fall by providing essential nutrients to your hair and keeping it healthy. It also nourishes the scalp to promote proper growth of hair. Brings new shine and strength to the rough, dry and damaged hair. Olive oil is great for hair because of the several properties it has – it is nourishing oil that manages to penetrate the hair shaft much more effectively than other oils; it has good moisturizing action, and is also an excellent hair conditioner. If you use the extra virgin variety, your hair also receives vitamin E and mono unsaturated fatty acids that play an important role in promoting hair growth. It is considered the best natural hair conditioner. It has the power to make hair stronger, shinier, softer and better moisturized. It is also used for the prevention of grey hair. It is also well known for preventing hair fall and also improves growth and pigmentation of hair. Contains triglycerides of ricinoleic acid that have anti-fungal, anti-bacterial and anti-inflammatory properties and vitamin E that has antioxidant action. But Castor oil should be used in small quantities and it is not recommended. Coconut oil provides all of its benefits. Makes hair black. Not recommended as Coconut oil provides all of its benefits. It is better to wash your hair with Herbal homemade shampoo made from Shikakai + Reetha + Amla. It creates a favorable pH-balanced environment in the scalp that fights dandruff and other infections. It is rich in vitamins such as vitamin C, vitamin D and other micronutrients, and nourishes the hair follicles to promote hair growth. Being a mild cleanser, it doesn’t strip the scalp of its natural oils. Gives natural color and silky touch to hair. You can use Shikakai + Reetha + Amla powder (if you buy them separately mix all of them in equal parts) available in market. Mix it in water. Heat the mixture for 2 min, then filter the water with cloth, then after cooling the water wash you hair. If you cannot get all powders, Shikakai is most important and must, then Reetha and then Amla. If you are in hurry, wash wet hair directly with powder. Then shampoo (to remove the powder residue) your hair (dilute the shampoo with water, and wash hair with the lather it makes). You can use Powder or Herbal Shampoo every day. Wash hair sparingly with a good-quality shampoo. Use conditioner depending on your hair type, length, and treatment damage. A good rule of thumb is to condition every time you shampoo your hair. 1. (Best Method) The easiest method of making a herbal shampoo is: soak amla, reetha and shikakai in different containers overnight. Filter the water in the morning and wash your hair with it. This natural shampoo prevents hair related problems like dandruff, dry scalp apart from leaning the scalp. Soak 5 pieces of Shikakai, 4 balls of Reetha (Soapnut) & handful of Amla (Indian Gooseberry) in about 500 ml of water overnight. In the morning, heat the mixture on gas till it just starts to boil. Let it cool, when lukewarm mash all the Shikakai, Reetha and Amla to a pulp to extract all the “goodness” (a lot of suds & froth is produced at this point). Strain (don’t skip this or else you’ll end up with bits of Shikakai and Amla mesh stuck in your hair) and use the liquid to wash your hair. The experience is a little different from using a shampoo. The moment the liquid touches your hair, it will seem to go all rough and entangled, the way to use this is to apply the liquid all over the hair and let it soak for 2-4 minutes before washing it all off with water. Don’t try and massage and lather like your shampoo – your hair will just get even more entangled than ever. Just apply the entire 500 ml generously all over wet hair and scalp. Let it soak, don’t disturb and wash off. After 4 minutes, rinse very well with water and apply some conditioner to the hair ends. Caution: Don’t let this enter your eyes – it will cause burning sensation. 2. Take shikakai, bhringraj and amla powder or extract(if available) and add in warm water. Add few drops of lemon juice and vinegar (for conditioning). Keep the mix for 30 minutes and apply this natural shampoo. It cures scalp problems and dandruff. Store it in refrigerator for long use. 3. Boil equal amount of reetha and shikakai, dried amla and dried brahmi leaves in water. Mash strain and use it. This herbal shampoo is a blend of shampoo and conditioner. 4. 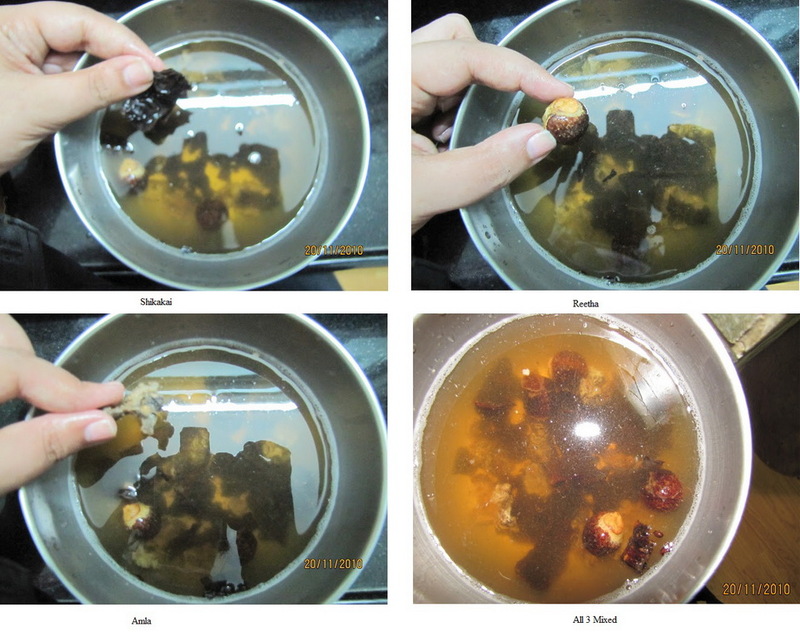 Soak dry soap nuts (reetha) in water overnight. Mash the solution in the morning and strain it. Add shikakai powder and mix well before applying. You can also mix this solution with your shampoo. 5. Another herbal shampoo with these items can be made easily. Soak reetha, shikakai and amla in 1 liter of water for 24 hours. Boil the solution and strain it. Keep it to cool. Add few drops of vinegar and wash the hair with it. Use these easy herbal methods at home and stay natural! This natural hair care is not harmful to hair and stimulates the growth of strong and smooth hair. Use conditioner depending on your hair type, length, and treatment damage. A good rule of thumb is to condition every time you shampoo your hair. For dandruff it is better to take medical help. Let hair dry naturally. If you must use Hair dryer, use it on lowest setting keeping it one feet away from the hair so that it feels like natural cool breeze. Hot air on wet hair evaporates the water in hair raising the temperature near hair very much causing much damage to hair. So any heat treatment should be avoided. After wringing the hair (a lot of water can be removed this way) dry the scalp by rubbing with a small washcloth. Then blot the hair dry with a soft cotton cloth (old T shirts are ideal). When the hair is no longer dripping, wrap it up in another T-shirt and let it dry naturally. It is better not to use a hair dryer. Hair does take a couple of hours to dry. Better use this time either to relax or to catch up on some work. Comb hair only when hair is dry. Do not comb your hair too much. Do not use hair brush (as it traps hair causes them to break or fall). Styling brush with rubber bristles is better if you must use hair brush. Treat or dye your hair sparingly, if at all. Style your hair naturally, minimizing styling damage. Lice Remedy – See Hair Care during rainy season. Hair Care during rainy season – In rainy season due to moisture dust particles get attached to scalp causing itchy scalp, lice, dust in scalp which increases hair fall very much. Daily Routine – Comb your hair. Put Oil for 1/2 – 2 hours. Wash your hair with shampoo. Use conditioner if required. Dry your hair naturally.